Despite earlier analyst reports, Take-Two's CEO says Mafia II will be a profitable game. 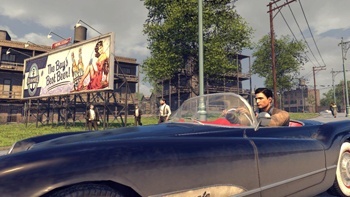 Wedbush Morgan analyst Michael Pachter posited last week that Mafia II was very unlikely to turn a profit due to a long development cycle and less than optimal overall review scores. Take-Two CEO Ben Feder refutes the assumption, saying that Mafia II is doing just fine for itself. Take-Two has been known for delaying games coming out of its subsidiaries (such as Rockstar Games and 2K Games), a trait which investors have been critical of. Mafia II took six years to get onto shelves, and by Pachter's estimates he gave to Gamasutra on developer 2K Czech's budgetary requirements to keep it going, he thinks the game ran at least $35 million with $6-10 million required to keep the studio open per year. CEO Ben Feder doesn't agree with Pachter, and though he gave no concrete sales figures for Mafia II, he did say Take-Two is proud of the game. He called 2K Czech a "talented studio," and said: "Based upon the initial launch, we expect [Mafia II] to be another profitable title for Take-Two." Whether Feder expects Mafia II to make a profit in 2010, or in later years as a slow burn, is unknown. He defended Take-Two's delaying practices by saying : "Red Dead Redemption took down any number of titles that were on budget and on time." Red Dead Redemption also happened to get amazing reviews though. We're not even two weeks out from the release of Mafia II, so maybe later down the line we'll see how the game's actually selling.